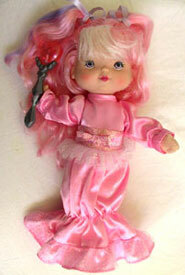 "My magic wand lights your way to Dreamland!" 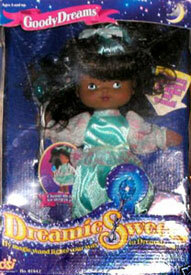 Dreamie Sweets were produced by DSI in 1997. 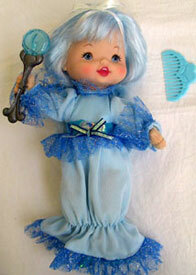 They were a very small set of 10" dolls holding a light-up wand and dresses which could be short or long (similar to Tugga Bows). 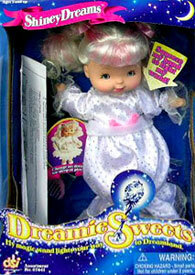 View all Dreamie Sweets on eBay.com or eBay.co.uk ! 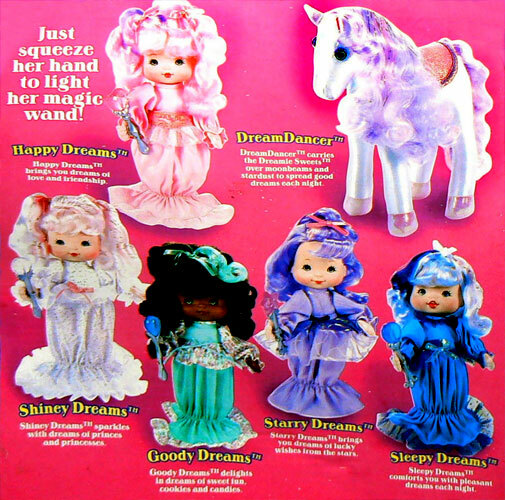 "Collect all five Dreamie Sweets and their horse DreamDancer for good dreams - both day and night! 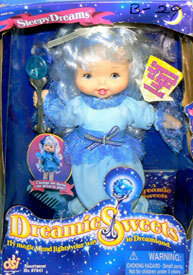 Each of the Dreamie Sweets comes with a comb and eight-page storybook. 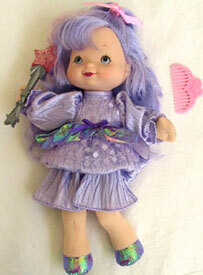 Their short daytime dress converts to an elegant long evening gown for lots of play fin. 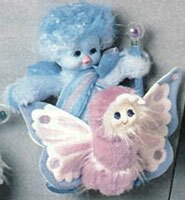 Because they are so sweet and cuddly you'll want to take them with you wherever you go!" 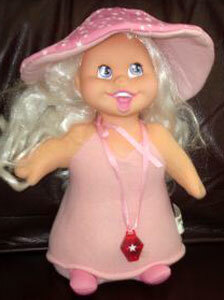 "Just squeeze her hand to light her magic wand!" 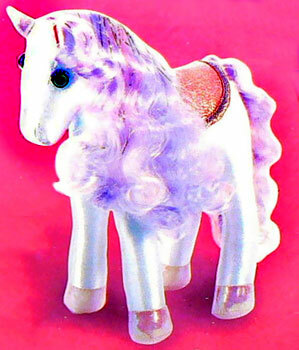 There were five dolls produced and one horse. 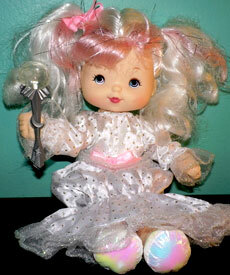 The dolls came with long dresses which could be shortened into another style, a light-up wand and a comb. 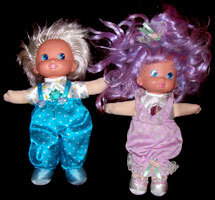 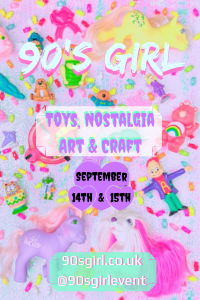 The dolls had plastic heads and hands, and soft bodies. 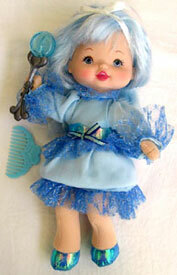 Their feet were iridescent fabric and they had long, brushable hair. 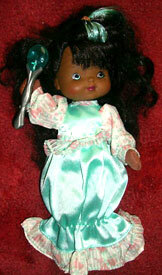 "Goody Dreams delights in dreams of sweet fun, cookies and candies." 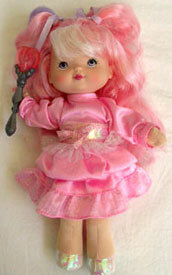 "Happy Dreams brings you dreams of love and friendship." 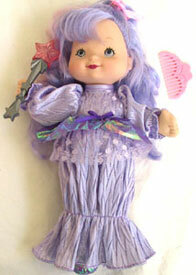 "Shiney Dreams sparkles with dreams of princes and princesses." 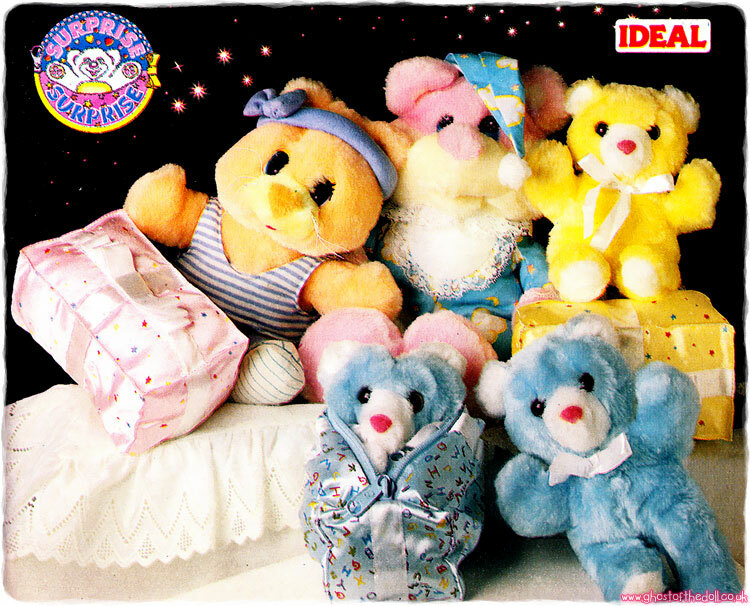 "Sleepy Dreams comforts you with pleasant dreams each night." 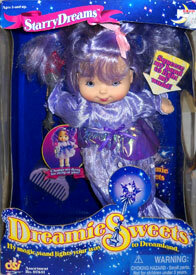 "Starry Dreams brings you dreams of lucky wishes from the stars." 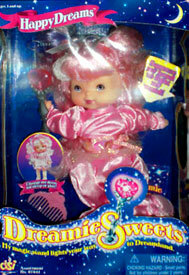 "DreamDancer carried the Dreamie Sweets over moonbeams and stardust to spread good dreams each night." 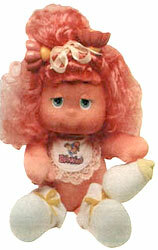 There was one animal friend produced also, a soft bodied pony called "DreamDancer" with brushable hair. 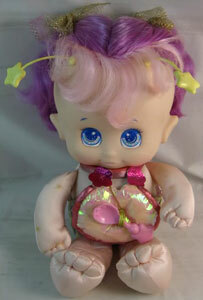 I've not come across this toy in any form yet, so only have the packaging image to go by.